First, I just wanted to say thank you to all the ladies on the Facebook group, "Canada Beauty Box Trades Or Selling" for participating in my Nail Fridays as well!!! I love seeing what everyone has done with their nails and I hope that it encourages all of us polish hoarders collectors to use their hoards collections! 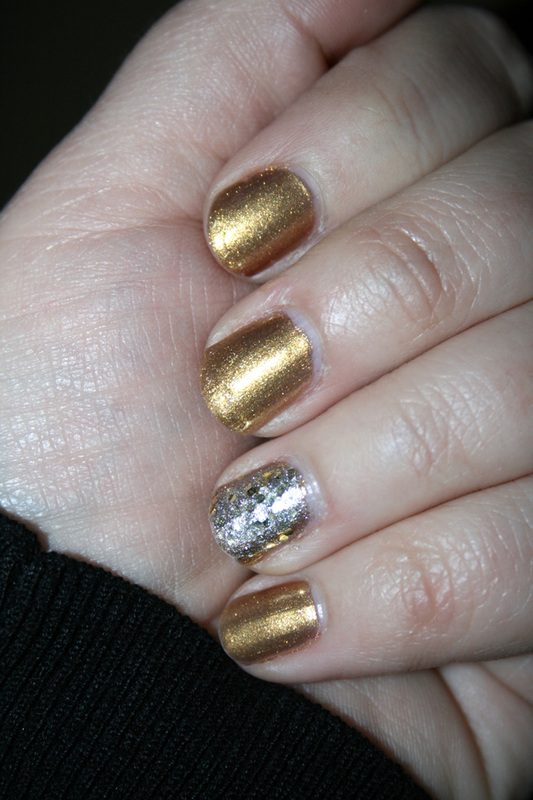 This was my New Year's manicure. I'm actually still wearing it and only did a minor touchup! I'll probably be taking it off today. I used Quo by ORLY - Fairytale on all my nails and layered Julep - Vivien on the accent nail. 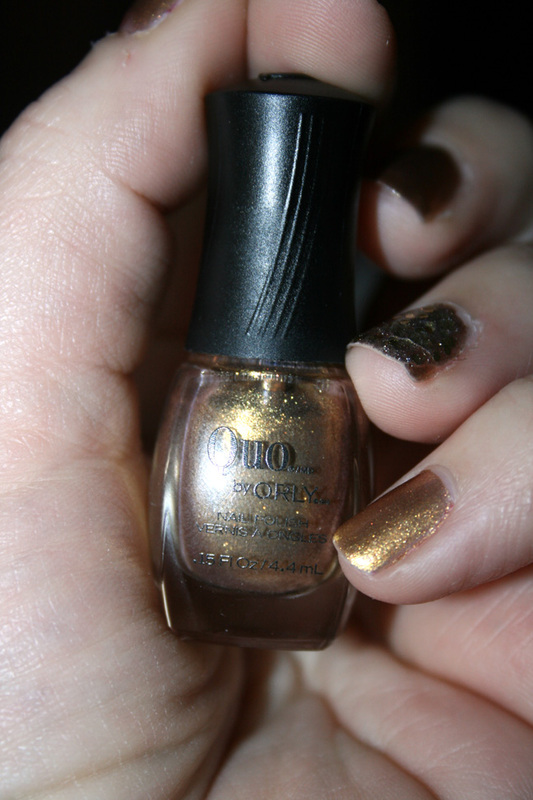 The Quo by ORLY is a mini polish. It came in a package of 18 as part of the Quo holiday collection. It retailed for $40. After Christmas it was 50% off. They sold out really quick. I got mine with Shopper's Optimum Points for free. Quo is an exclusive brand to Shopper's Drug Mart. Some of the colours are made into full size bottles, but I don't believe all of them are. The Quo formula is really good and it took 2 coats to get this opaqueness. The miniature bottle also means a smaller brush which took me some getting used to. Once you are used to it, it's a breeze! I'm so excited about the Quo by ORLY polishes because there are tons of cute colours! The accent nail was painted with Julep's Vivien. Vivien was in the December Julep Maven box. It's a really chunky glitter with large hexagons. It does have a base colour in it that resembles Sienna. I just layered it on top of one coat of Quo "Fairy Tale" Like most chunky glitters it has to be dabbed on rather than swept on. I did sweep it the first time and didn't get much glitter on. This was a really thick smathering (I made a word!) of Vivien. I wanted it to look super chunky and sparkly! Do you have any of these colours? What do you think of the colours I used...is it something you would try? I'm really interested in getting more Quo colours! I love Vivien too! You have to be careful with how it's applied, but the result is fantastic! Very pretty. I actually posted mine and I think the next 51 weeks will be amazing to try out polishes in my collection that i haven't used in awhile. Have you thought about having people link to your post so that everyone can see other nails of the day/week? I know, right?! I think it will be fun! That is a good idea and I will try and find that gadget where you can do that! Gorgeous, I love the accent nail! 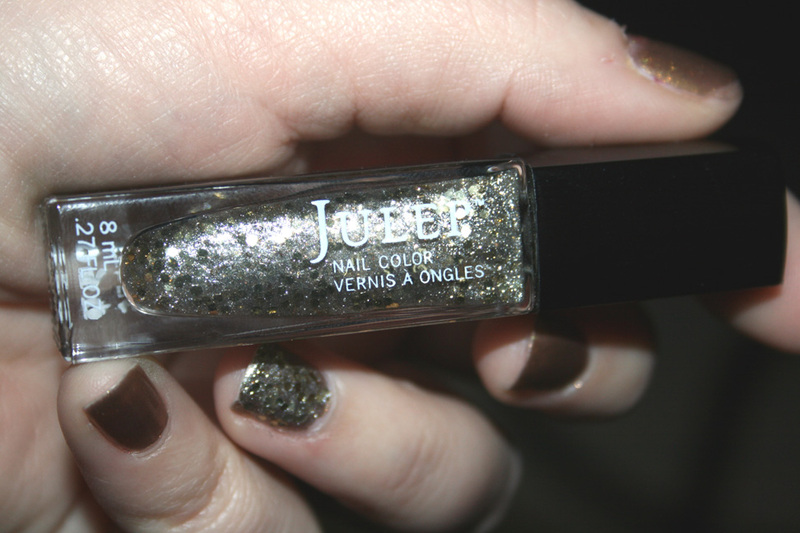 I just tried Julep polish for the first time last month and I really want to try some more... Vivien looks amazing! Be careful, it's super addictive! It is right?! Have you signed up for Julep Mae? Quo has really come out with some awesome products! That polish is lovely!! Yes, I've been using Quo now for about 5 years and I've always enjoyed the brand!